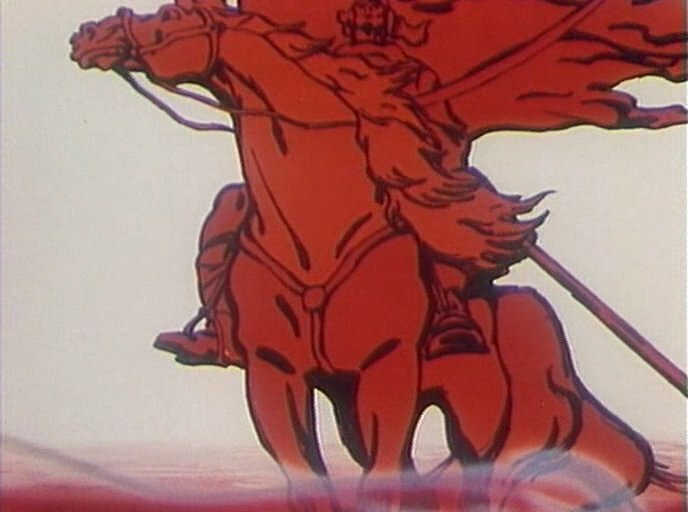 You are currently browsing the tag archive for the ‘soviet propaganda’ tag. ‘Kino-Circus’ (also called Cinema Circus) is the most inspired of the anti-fascist war propaganda cartoons made in the Soviet Union. In the first, ‘Adolf the dog trainer and his pooches’, Hitler throws a bone at his three dogs, Benito Mussolini, Miklós Horthy and Ion Antonescu, the leaders of his allies Italy, Hungary and Romania, respectively. In the second, ‘Hitler visits Napoleon’, Hitler asks Napoleon’s tomb for advice, but the deceased drags him into the tomb. It’s the most prophetic of the three, for indeed both Napoleon and Hitler were defeated in Russia. 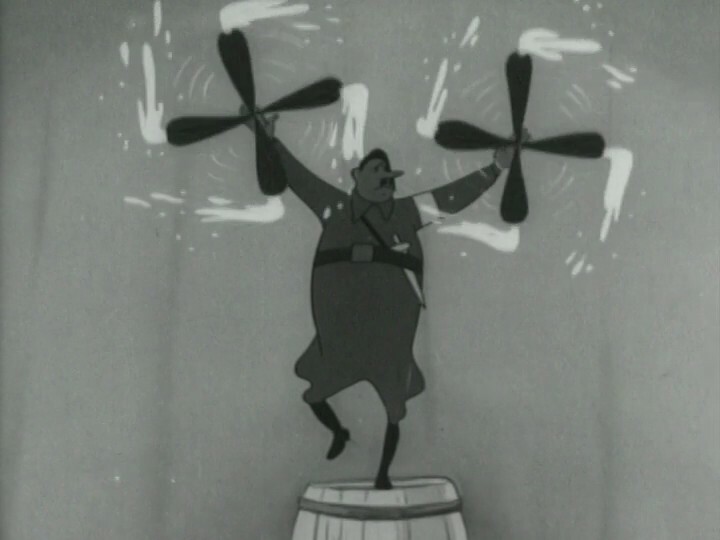 In the third, ‘Adolf the juggler on powder kegs’, Hitler juggles with several burning torches on a pile of powder-barrels, representing the countries he has occupied. When he accidentally drops one of the torches, the barrels explode. 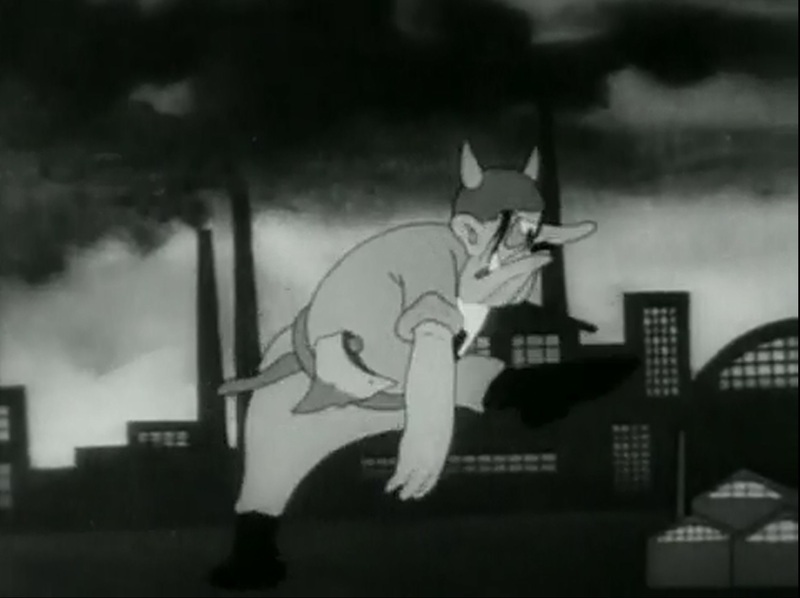 The animation is particularly silly in this sequence and a delight to watch. After the grim political posters from 1941, ‘Kino-Circus’ is more lighthearted. The film ridicules Hitler more than it makes him threatening. Quite surprising since in1942 Nazi Germany was still a serious threat to the Soviet Union: Leningrad suffered under a long siege, and the Soviet Union had only just begun its counter-attack. Interestingly, both directors of ‘Kino-Circus’ later became famous for their sweet fairy tale films. ‘The Vultures’, like ‘4 newsreels‘ and ‘Fascist Boots on our Homeland‘ is a so-called political poster. Like the other two films from 1941 it is soviet propaganda at its most aggressive. ‘The Vultures’ is the least interesting of the set. 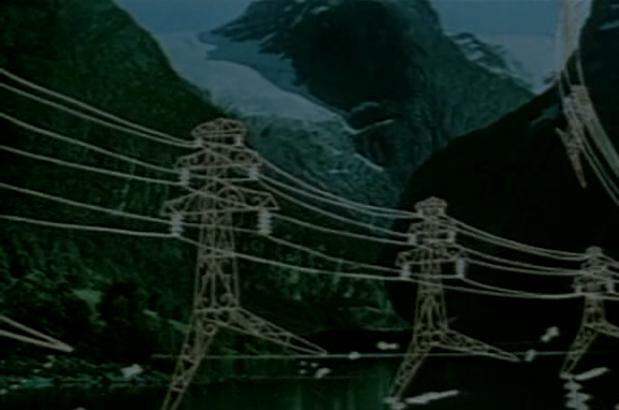 Its opening shot is its best part: opening with two eyes in the dark, just like ‘The Skeleton Dance‘ (1929). These eyes appear to belong to a fascist vulture. 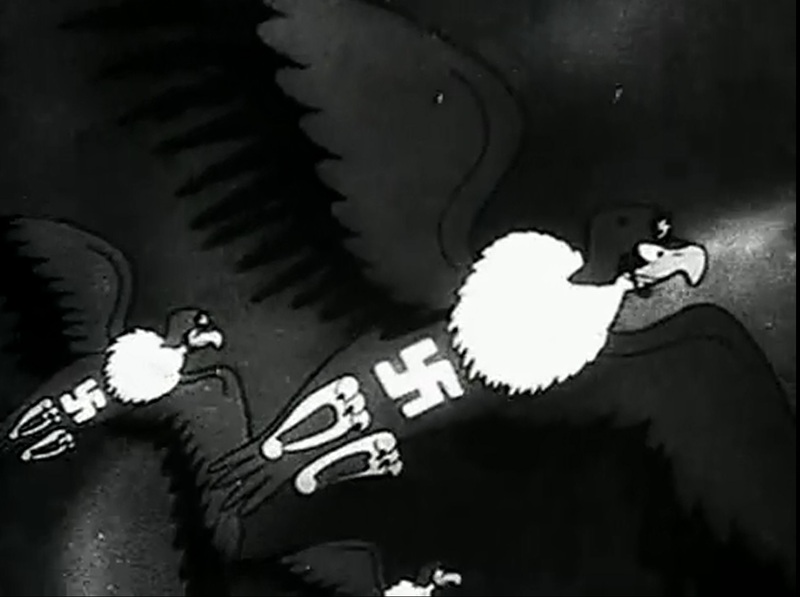 he and the other fascist vultures (battle planes) are chased away and destroyed by the Soviet airfleet in a rather silly and playful-looking air battle, accompanied by heroic march music. About the director of ‘The Vultures’, Panteleimon Sasonov (1895-1950), little can be found. Giannalberto Bendazzi tells us in his excellent book ‘Cartoons – one hundred years of cinema animation’ that he made an animation film called ‘The Tale of the Pope and Baldo his Servant’ in 1939. Like ‘4 Newsreels‘, ‘Fascist Boots on our Homeland’ is a so-called ‘political poster’, a short propaganda film that knows no competition in its vicious imagery. 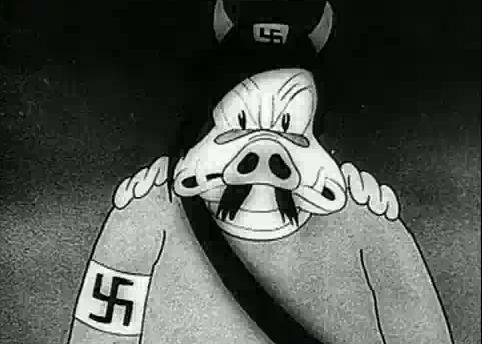 In ‘Fascist Boots on our Homeland’ a horrific fascist pig marches on, trembling several European countries until he gets beaten by the Red Army. 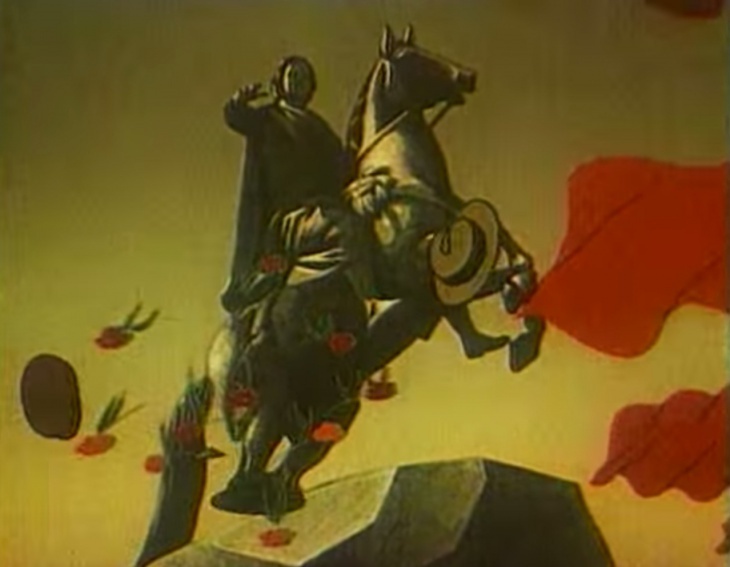 The film also contains a very patriotic song and rather associative imagery, including that of Russian soldiers riding horseback, a heroic image from the Russian civil war (1917-1923). It’s interesting to compare the Soviet images of Nazis with that of American propaganda films from the same era. Whereas in American propaganda, like ‘Der Fuehrer’s Face‘ fascist leaders were caricatured and ridiculed, in the Soviet Union they were depicted as monsters and swines. The whole difference may be that the Soviet Union was invaded, while the United States were not. Indeed, the US were less kind to the Japanese, who did stain American soil: they were all portrayed as silly, but treacherous Untermenschen, whom one could easily kill without remorse (e.g. 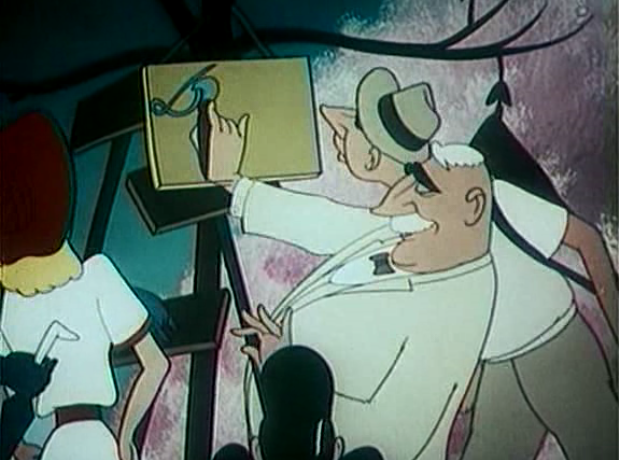 in ‘Bugs Bunny nips the Nips’ from 1944 and the Popeye film ‘You’re a sap, Mr. Jap‘ from 1942). The Soviet propaganda film ‘4 Newsreels’ consists of four so-called ‘political posters’, which are as blatant as propaganda can get. 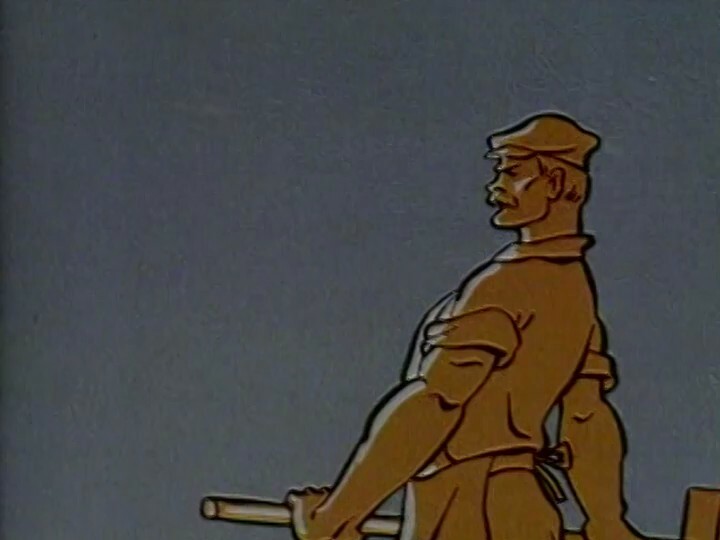 The first, ‘What Hitler wants’, shows us an extremely ugly and vicious caricature of Hitler marching towards the Soviet Union until he is pierced by the Soviet bayonet. In the second, ‘Beat the fascist pirates’, sea serpent-like German submarines are defeated by the Soviet fleet. The third, ‘Strike the Enemy on the front and at home’, is typical for the paranoid society Stalinist Russia was, warning against treacherous fascist spies, foreign agents and saboteurs: “Be vigilant! Remember, our enemy is cunning!”. The fourth, ‘A mighty handshake’, tells us about the union between England and the Soviet Union against Nazi Germany, showing two mighty giant soldiers shaking hands and crushing a tiny rat-like Hitler in doing so. Obviously, Germany’s invasion of the Soviet Union left no room for subtleties. 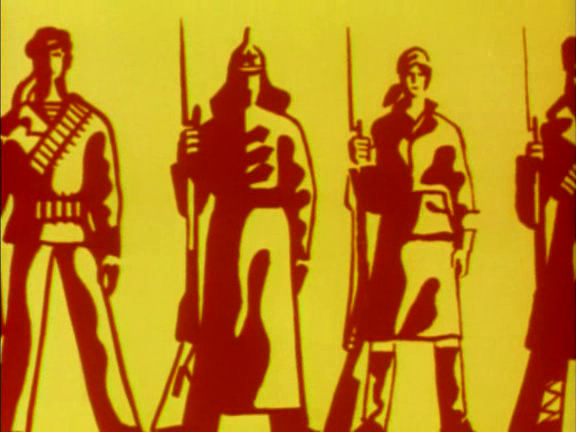 ‘4 Newsreels’ was directed by five veterans of animated Soviet propaganda. 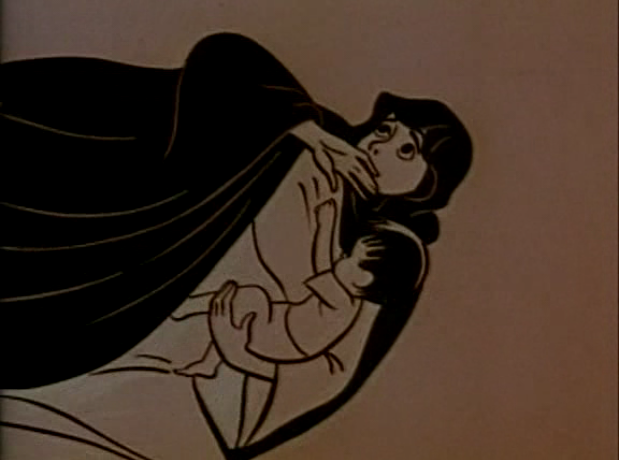 All had made animated films since the 1920s. 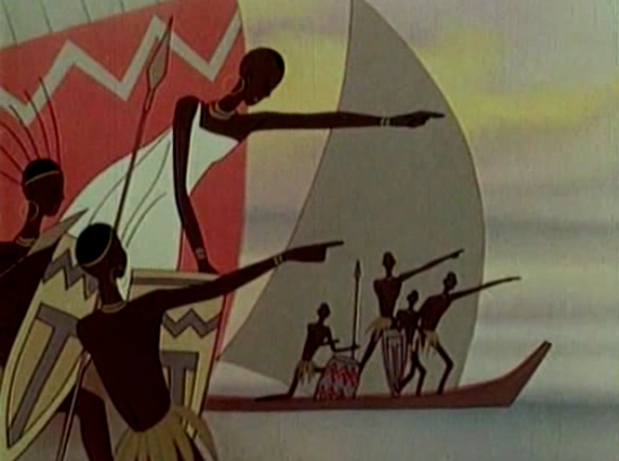 Of the five, Ivan Ivanov-Vano (1900-1987) would become the most successful, directing animated films up to the 1970s. Luckily, he and Olga Khodataeva would be able to show a gentler side in numerous animated fairy tale films for children. 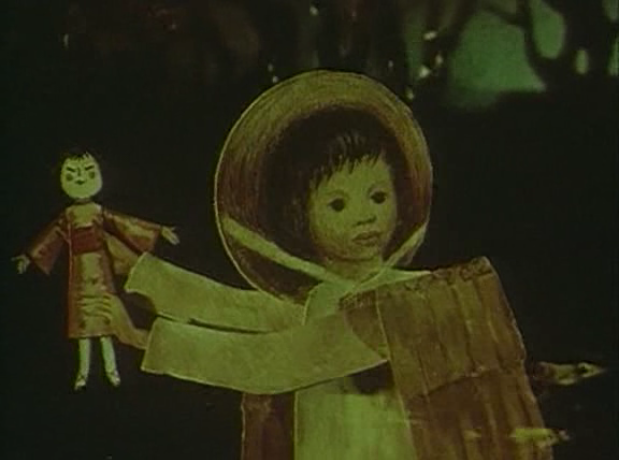 ‘Proud Little Ship’ is a Soviet propaganda film, which is clearly directed to children. 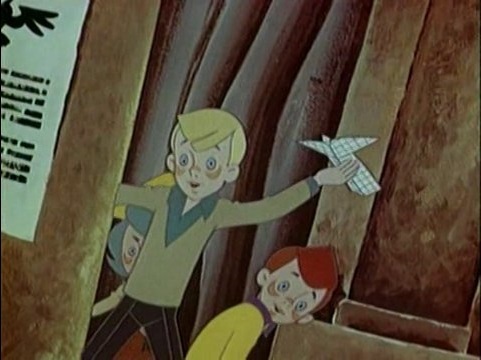 Three little boys make a small red ship as a copy of the famous cruiser ‘The Aurora’. This little ship sails the seas and is greeted with enthusiasm among all the people of the world. There are some mean militarists who try to destroy the little ship, but they do not succeed. These militarists are drawn extremely silly, while the rest of the people are drawn rather realistically and appear as noble and gentle. Nevertheless, these drawing styles blend surprisingly well. Moreover the design and choreography of movement is often gorgeous. All the action is silent, while the story is told by a narrator, who provides the clearest propagandistic message of the film: “the proud little ship sailed as a messenger of a happy life, which, as spring after winter, would certainly come to all people”.